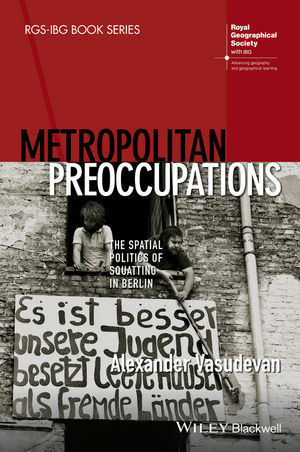 In this, the first book-length study of the cultural and political geography of squatting in Berlin, Alexander Vasudevan links the everyday practices of squatters in the city to wider and enduring questions about the relationship between space, culture, and protest. Alexander Vasudevan is Assistant Professor of Cultural and Historical Geography at the University of Nottingham, UK. A co-editor of Practicing the Archive: Reflections on Method and Practice in Historical Geography (with E. Gagen and H. Lorimer, 2007) his work has been published in several prestigious journals, including Antipode, Cultural Geographies, Environment and Planning A and D, Progress in Human Geography, and Social and Cultural Geography. His current research focuses on radical politics, urban squatting and the wider geographies of contemporary precarity.